Reising was selected as a recommended firm in the 2018 edition of IAM Patent 1000: The World's Leading Patent Professionals. 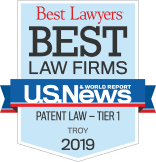 Our firm was named to the 2018 U.S. News & World Report list of Best Law Firms for patent law in Michigan. Our attorneys have authored seven editions of Cases and Materials on Patent Law Including Trade Secrets, an essential textbook for patent law in accredited law schools across the U.S. In 2016, we filed over 1,200 utility patent applications and over 200 industrial design patent applications. Our firm helped protect the innovations of automotive luminaries Ransom E. Olds, David Buick, and the Fisher Brothers. We manage large worldwide patent and trademark portfolios for many Fortune 500 corporations. We meet routinely with clients to plan patent filing, assist with budget preparation, and identify cases for maintaining patents and trademarks. We help our clients thoughtfully select countries in which to pursue intellectual property protection based on local markets, competitor locations, and global economics. We help our clients navigate the complex world of patents and trademarks during product development—to avoid conflict and prepare for it. We often work to clear product designs before they are produced and trademarks before they are used in commerce. Clearing a path for your product sometimes means conducting worldwide patent and trademark searches through trusted third-party specialists. We also opine on the validity of patents and trademarks, and we counsel clients on designing around competitor patents. We have extensive experience in negotiating, drafting, and completing license agreements based on patented technology and decades of acquired knowledge. We work closely with our clients to understand the value and scope of the intellectual property rights being transferred. We help our clients navigate the complex world of patents and trademarks during product development—to avoid conflict and prepare for it. We have extensive experience in negotiating, drafting, and completing license agreements based on patented technology and decades of acquired knowledge. We help our clients thoughtfully select countries in which to pursue intellectual property protection based on local markets, competitor locations, and global economics. We maintain a large network of overseas intellectual property associates in every industrialized country. We have developed relationships with these associates for decades. These well-established relationships provide our clients with trusted services throughout the world. Our foreign associates understand the nuances and peculiarities of local laws and regulations, and they know how to navigate them. We manage large worldwide patent and trademark portfolios for many Fortune 500 corporations. We meet routinely with clients to plan patent filing, assist with budget preparation, and identify cases for maintaining patents and trademarks. We also help clients identify opportunities where their portfolios can be expanded or rightsized and where they can work around a competitor’s key patents. We provide counsel for proceedings before the USPTO, including requests for patent reexaminations, patent reissues, trademark oppositions, and trademark cancellations. We also handle patent disputes during prosecution and after issuance via new mechanisms under the Leahy–Smith America Invents Act: third-party citation of prior art, derivation proceedings, inter partes review, and post-grant review. Our firm has successfully handled litigation matters from the lowest state courts and federal district courts up to the Court of Appeals for the Federal Circuit (CAFC) and all the way up to the Supreme Court of the United States. Our high-profile success includes the SCOTUS case TrafFix Devices, Inc. v. Mktg. Displays, Inc., in which our firm convinced the court of an overlap between trade dress law and patent law. There are often ways to contest a patent’s validity without lengthy litigation. The Leahy–Smith America Invents Act (AIA) provides a number of administrative options for patent review, including inter partes review (IPR), post-grant review (PGR), and CBM proceedings. There are often ways to contest a patent’s validity without lengthy litigation. The Leahy–Smith America Invents Act (AIA) provides a number of administrative options for patent review, including inter partes review (IPR), post-grant review (PGR), and CBM proceedings. Reising attorneys have invaluable experience appearing before the Patent Trial and Appeal Board (PTAB) and know how to efficiently manage challenges to patent validity as well as how to defend against them. Patenting and protecting groundbreaking technology begins with understanding that technology. That’s why so many of our attorneys have degrees in mechanical, chemical, electrical, and computer science engineering, as well as private-sector experience. Patenting and protecting groundbreaking technology begins with understanding that technology. That’s why so many of our attorneys have degrees in mechanical, chemical, electrical, and computer science engineering, as well as private-sector experience. We were there for the rise of the mass-produced automobile, and today we represent vanguard companies and universities developing future technologies that include autonomous vehicles, augmented reality, and everything in between.